The show starts out after the last Tribal Council, and Shamar is having a major meltdown at camp. Cuz, you know, yelling and screaming at your tribe mates is a good way to stay in the game. Eddie and Reynold decide to try to ruffle Shamar's feathers even more so that the tribe decides to vote him out. Back at the Fans camp, Shamar told everyone about the dark times he had when he came back from Iraq, and how playing Survivor brought back all the anger in his life. And he wanted to quit the game. And then he didn't quit. Watched this on the DVR tonight, because we were watching the finals of the women's curling championships here in Canada. Teams had to take a water taxi, which didn't start operating until 7:30, so we're 2 minutes into the show and everyone is equalized already. Argh. Hate that. The Surfers chatted with the Father/Son team about the second Express Pass, but decided they weren't going to give it to them right away, and it was conditional on no one else finding out about the secret agreement. Basically, the Surfers were waiting on a better deal from another team and a lot of sucking up. The water taxis took the teams to a resort where they had to find the chapel and get a blessing, and a clue. The Detour was either harvesting pearls, or dive for a treasure trunk and construct an underwater picnic dining experience. Really. A quick review as we are in the midst of home renovations and the house is a disaster. The Favorites won immunity and reward. Shamar was on the chopping block for the fans due to his lack of work ethic. Reynold from the fans found a hidden immunity idol after approximately 9 seconds of looking and no clues. He got called out on it in Tribal Council and so he showed it to everyone. Them he said he would play it and didn't. Next week: Both camps are chaos. 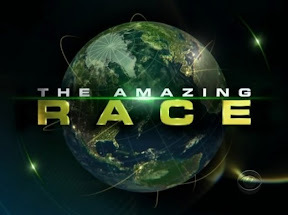 It's a new season of The Amazing Race! Which means a whole bunch of new teams I'm gonna have to give nicknames to because of my inability to remember real names very well. I keep telling my wife - whassherface - that I'm great with faces, but terrible with names. Fortunately, CBS casts teams to be goofy gimmicks, by and large, so nicknames are easy to come by. So we have Team Alabama Mullets; (complete with the #mullet hashtag ... kill me now); Team Hockey Brothers; Team Roller Derby Moms; Team Newlyweds; Team Father/Son; Team Dating Surfers; Team Twin Docs (who are OB-GYNs); Team Best Friends; Team YouTube; Team Firefighters; and Team Country Singers. It's a new season of Survivor - Survivor Caramoan (Survivor: Where?) Fans vs. Favorites is a fun iteration of the game, even if the name really should be "Marks vs. Gimmicks". And it's a 90 minute season premiere, meaning more time devoted to people lounging around camp. As usual, this review CONTAINS SPOILERS. If you don't want to know what happened tonight, don't read on.